Question: What’s new in The Little SAS Book for Enterprise Guide 4.2? Looking at The Little SAS Book for Enterprise Guide 4.2, I am struck by how similar it looks to the previous edition. Updating this book for EG4.2 was not a matter of simply adding a few new sections. On the contrary, practically every section needed to be reworked. So it feels like the changes should be more obvious than they are. One thing that Lora Delwiche and I are proud of is that this edition is actually shorter than the previous one (371 pages versus 387). We always try to keep the Little SAS Books short, but writing a new edition means adding new features. Normally the new book would be longer, not shorter. So how did we do it? We combined sections. I won’t list them all because if we did a good job, the changes shouldn’t draw attention, but in one case we actually distilled three sections into one. That’s six pages reduced to two. Another reason the book is shorter is that some features in EG4.1 have been removed from EG4.2. Most notable is the absence of reading Excel spreadsheets as is. That was the ability to read (and even edit) Excel spreadsheets–as Excel spreadsheets–in EG rather than converting them to SAS data tables. I have met people who were upset by the loss of this feature, but personally I am not sorry to see it go. The ability to interact with your spreadsheet in EG was indeed cool, but it was also confusing and (in my opinion) had little real benefit. How different is it really to have EG automatically read your current spreadsheet versus running your project so that EG will import your current spreadsheet? This topic was confusing enough in EG 4.1 that we wrote an entire tutorial about it. Taking this topic out of LSBEG4.2 allowed us to remove a 2 page reference section and a 26 page tutorial. Tutorial B Reading Data from Files The raison d’etre of this section was to explain the different ways to read Excel spreadsheets. Now that there is only one way, we no longer need a complete tutorial on this topic. 1.14 Using SAS Enterprise Guide Help The What is window is gone from EG4.2, and without it this already lightweight section became featherweight and blew away. 2.3 Creating SAS Data Libraries with SAS Enterprise Guide Explorer This feature is still around in EG4.2, but metadata issues have become more complex. We decided to focus on the Assign Project Library task which is available to all users. 2.11 Using Microsoft Excel Spreadsheets As Is Gone, gone, gone. 2.14 Reading Formatted Data You can still specify informats when you read data using EG4.2, but EG is so good at guessing how your data should be read that we had a hard time coming up with a credible example. There will still be people who need to specify an informat in order to have EG read their data properly, but such cases have become uncommon. 1.2 Splitting the Resources Pane and Workspace The Resources pane is new, and it folded neatly into our existing section on splitting the workspace. 1.6 Creating and Exporting Task Templates The new task templates, one of my favorite new features in EG4.2, allow you to reuse your task settings. That way you don’t have to start over from scratch every time you use a task. 1.15 Viewing Program and Project Logs Project logs are not new in EG4.2, but previously we only mentioned that they existed. Now we have a section that actually shows project logs and explains the difference between project logs, program logs, and task logs. Logs are a lot more visible in EG4.2 than they were before, and there are some important differences between the different types of logs so it makes sense to address that. 2.6 Inserting Computed Columns in a Data Grid This is not a new feature, but there were reasons that prevented us from including it in earlier editions. Now with EG4.2, we decided that this feature is ready to be included. It is a handy way to quickly compute a new column based on existing ones. People may not have known about it before, so I’m glad we added it. 5.1 Filtering Data in a Task This new feature is a little rough around the edges, but I think people will use it anyway because it is so handy to be able to subset your data inside a task. 5.2 Using the Filter and Sort Task This new task also allows you to subset your data without facing the complexity of the Query Builder–and you can sort data in the same step. 6.1 Methods for Combining Tables This section describes queries at a conceptual level, something that we think many people will appreciate. 7.9 Creating Grouped Reports with User-Defined Formats This is not a new feature, but shows how you can leverage user-defined formats when you create summary reports. 10.6 Controlling the Axes Having a separate section on modifying axes in graphs adds more depth to our coverage of graphics in EG. 11.4 Combining Results into a Single Document and 11.5 Adding Text, Images, and Headings to Reports While we combined many other sections, in this case we split a section allowing us to show more detail about using the report editor to create custom reports. 11.6 Exporting Results to a File This topic also is not new, but it’s more important now that SAS Report (a proprietary format) is the default for results. You can export SAS Report results as SAS Report, HTML, XML, or PDF. 12.6 Creating Prompts for Text Values In EG4.1 they were called parameters, now they are called prompts and there are many more options. This section creates a text value prompt that is used in the following sections to illustrate a project condition. 12.7 Using Prompts in Project Conditions Project conditions are a cool new feature in EG4.2 that allow you a new level of control over how your project runs. 12.8 Running Projects with Conditions This section explains some of the intricacies of how project conditions work when you run them. I just returned from Seattle where I had the pleasure of attending SAS Global Forum 2010. It felt like a three day whirlwind of presentations and demos shared with 3,000 of my closest friends. Frankly, there was so much going on that much of what happened already seems like a blur, but here are a few points I want to be sure to remember. The OMG moment during the Opening Session was the announcement that SAS OnDemand for Academics (the cloud computing version of SAS software) will be free to students and faculty for the teaching of courses starting this fall. Everyone I talked to agreed that this is a brilliant move on the part of SAS Institute. This will put SAS in a better position to compete with R, and will train much-needed new SAS professionals. I’ve been excited about ODS Graphics since the last time SGF met in Seattle. 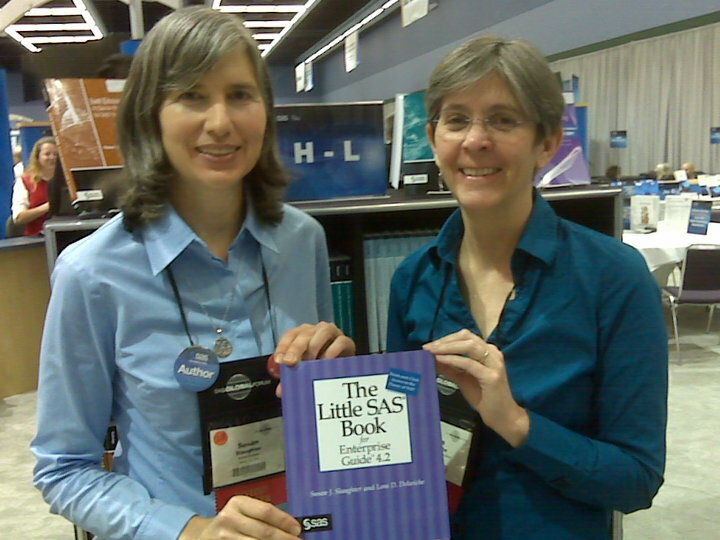 That was 2003, and we had just finished writing the third edition of The Little SAS Book. There in the Demo Room was Bob Rodriguez (the head of statistical development at SAS Institute) standing next to a big poster full of beautiful graphs and I thought, “Arrrggg, now we’re going to have to write a fourth edition!” At SGF in 2009, there were only a few papers on ODS Graphics and as far as I know Lora Delwiche and I were the only people outside of SAS Institute to present anything on the topic. This year there was an explosion of interest in ODS Graphics with lots of presentations by both SAS developers and SAS users. SG Designer, a point-and-click application for building custom reusable graphs, is still experimental, but hugely promising. You can try SG Designer by submitting this statement in Display Manager. The word is that SG Designer will be available in Enterprise Guide which should add a ton of functionality and sophistication to EG’s graphics capabilities. Graph Template Language is a surprisingly accessible way to create graphs for folks who need features the SG procedures don’t provide. Meanwhile, more and more features are being added to the SG procedures. When we first started writing about ODS Graphics three years ago, Bob Rodriguez told us that ODS Graphics would never do everything that traditional SAS/GRAPH does and would therefore never replace it. As more and more features are added to ODS Graphics, that assertion is beginning to look iffy. Some of the features being added are maps, pie charts, and a feature similar to annotation. (People disparage pie charts, but whether you like them or not, they are a fact of life.) It’s easy to see why people who avoided traditional SAS/GRAPH and its complexity would be attracted to ODS Graphics, but I was struck by the fact that a lot of users of traditional SAS/GRAPH are now looking at ODS Graphics too. I once told an SPSS user that SAS/GRAPH is “incredibly flexible, incredibly powerful, incredibly hard to use.” That’s not true any more (still flexible and powerful, but no longer hard to use). It sounds melodramatic, but I really believe that ODS Graphics will save graphics in SAS. EG 4.3 looks like EG 4.2, but includes fabulous new features for SAS programmers. These include syntax suggestion and autocompletion to help you write SAS programs, a code analyzer to read your program and turn it into a process flow, and a new autoexec process flow which will run automatically every time you open a project. This may not have been a highlight for most attendees, but seeing our newest book in print for the first time was definitely a highlight for me. My own copies arrived after the conference so the people who bought copies there scooped the authors. In 2013 SGF will return to San Francisco! This is a very big deal for SAS users in my area especially since many are government employees and cannot travel outside of California. If I remember properly, the last time this conference was held in San Francisco a record was set for attendance so coming back is a great idea. The last item on my list is the musical group that entertained us all at the end of the Opening Session. I thought these five incredibly talented people fit right in at SGF because while most SAS users aren’t much for singing (judging from the rather pathetic audience participation), SAS users are clever and innovative. Those words also describe VOX Audio. If you didn’t get to hear them, then click here for a sample. If you missed the conference, you can still learn a lot by reading the papers. My favorite place to find SAS conference papers is Lex Jansen’s site. I saw Lex at the conference, but didn’t get to talk to him. Oh well, next time…. In just a few days I will fly to Seattle for SAS users’ biggest event of the year: SAS Global Fourm, April 11-14, in Seattle, WA. I hope to see you there. If you are a fan of SAS Press, then be sure to visit the Pubs booth in the Demo Room Monday from 6:00-7:30 pm. That’s when SAS Press will host the Authors’ Reception and Book Drawing Mixer. The drawing will feature one book by every published author in attendance. So come on by to meet lots of authors and test your luck. I just learned that you must register for the book drawing by 6:15 to have a chance to win, and, of course, you must also be present to win. The drawing proper will start promptly at 6:30 and will be over by 6:45! Then on Tuesday in the highly-coveted 8:00-9:20 am time slot, Lora Delwiche and I will present Using PROC SGPLOT for Quick High-Quality Graphs , in the Hands-on Workshop section, Room 6C. I am enormously grateful that the Kick Back Party is Tuesday night, not Monday! If you are an early riser, then why not join us? Can’t make it to Seattle? Here are the links for our paper, handouts, data sets. Using PROC SGPLOT to Create Quick High-Quality Graphs: The Paper One of the great new features in SAS 9.2 is ODS Graphics which includes the SGPLOT procedure. This paper includes both an introduction to PROC SGPLOT, and a concise reference of syntax that you may want to keep on your desk whenever you write PROC SGPLOT code. Other topics covered are PROC SGPANEL, options for controlling and accessing individual graphs, and the ODS Graphics Editor. Using PROC SGPLOT to Create Quick High-Quality Graphs: The Data This zipped file contains the SAS data sets used in the paper and hands-on workshop. Using these data, you can run the examples yourself. Quick Reference Tables for PROC SGPLOT This file contains tables summarizing the rather extensive syntax for PROC SGPLOT. These tables are a good tool for learning PROC SGPLOT, and also a handy reference. These are the same syntax tables that appear in the paper listed above but are in grayscale instead of color.